Where did I get it? I bought it on Kindle when it was really cheap a few weeks ago. What's it about? Moonbeam is seventeen and right at the beginning of the book, there has been a fire at the compound she has lived in for most of her life. Moonbeam has been injured in the fire, and first wakes up in hospital, then in a secure unit. She begins to have therapy with Dr Hernandez, but doesn't trust him at first. But through the book we read about Moonbeam's life within The Lord's Legion, a cult in Texas. The cult was led by the charismatic Father John, a self-proclaimed prophet who took over from a looser, less rigid leader called Father Patrick. No one was allowed to leave the compound and John preached about the evilness of the world and the fight that would occur and bring about the end times. Moonbeam's mother had been Banished from the cult and Moonbeam was no longer allowed to talk about her. All the adults of the cult have died in the fire and Moonbeam is one of the eldest that is left. After a few days with Dr Hernandez he is joined by an FBI agent, Agent Carlyle, who is part of the team investigating the Lord's Legion and the fire. Moonbeam doesn't trust either of them, but she tells more and more of the events that happened within the compound. After therapy each day she has group therapy with the rest of the children who remain, including Luke, who is angry that he isn't dead and hasn't been able to Ascend to Heaven with the adults, and her friend Honey. I really like reading about religious cults. I did Theology for my undergraduate degree and particularly enjoyed a module called Christian Communities, Sects, and Cults. The way that cults develop and the way they cut themselves off from the world is endlessly fascinating to me. Charismatic leaders like Father John fascinate me and I felt the author did a really excellent job of portraying him. There are a lot of parallels with the true events that happened to the Branch Davidians in the siege at Waco, parallels that Will Hill himself acknowledges at the end of the book. I felt like there were a few TOO many parallels, really, although Hill did a good job of trying to imagine what a survivor would feel like. There's also a lot of repetition in the book. 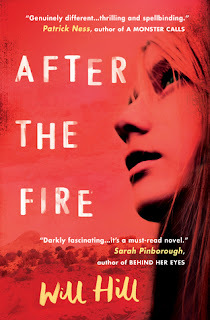 I understand the decision to write the book set from "after" the fire, but it does mean that some things, like Moonbeam's distrust of the psychiatrist and the police, are gone over again and again. If the book was linear, this could've been avoided. Finally, I felt like the end was a little bit too neat. I liked Moonbeam and her story, and I think the setting of the cult was a really good one, but I didn't gel entirely with the book. Are any main characters people of colour? No, and I wish this had been addressed. Cults like the Branch Davidians are often exclusively white because of racist interpretations of the Bible and of racist ideas like keeping the believers 'pure'. It would have been an interesting side note. Are any main characters disabled either mentally or physically? Yes. Is there any talk of death? Yes, lots, and trigger warning for suicide too. What criticisms do I have? I think I've covered them above! The book seemed to take me ages to read and I think that was mostly due to the repetition. I also felt there were places where there was too much telling and not enough showing. Like there's a few times when Moonbeam asks a question the doctor and Agent Carlyle about her mother or her friend Nate and is told they don't know anything. The next lines are something like "I believe him". But why? We're not shown in enough depth as to why, and that sort of frustrated me. Would I recommend the book? Yes, it is a really interesting story. Why did I choose to read it at this point in life? It's one of Zoella's current book club choices and I wanted to see what it was like for myself! What other books is it like? It's a lot like Seed by Lisa Heathfield which is also about a religious cult, but it's also a lot like Paper Butterflies by Lisa too. I'd be interested in more books like this. How many stars? I gave it four out of five on Goodreads so that would usually be eight out of ten, but... I 'm going to go for 7.5. I felt like there were good bits and bad bits, but it is overall a very strong novel.